Formosa AS » Blog Archive » DrayTek kåret til beste trådløse ruter for 4. gang! For fjerde gang har DrayTek tatt seiersplassen i PC Pro’s kåring av beste trådløse ruter. Vi er selvsagt stolte som haner og annen hønsefuggel! The router is arguably the most critical piece of equipment in your household, the one that all your computers, tablets and smartphones rely upon for a reliable connection to the outside world. No other vendor could match DrayTek for range and reliability, according to our survey, while it comes second only to Cisco in terms of speed. 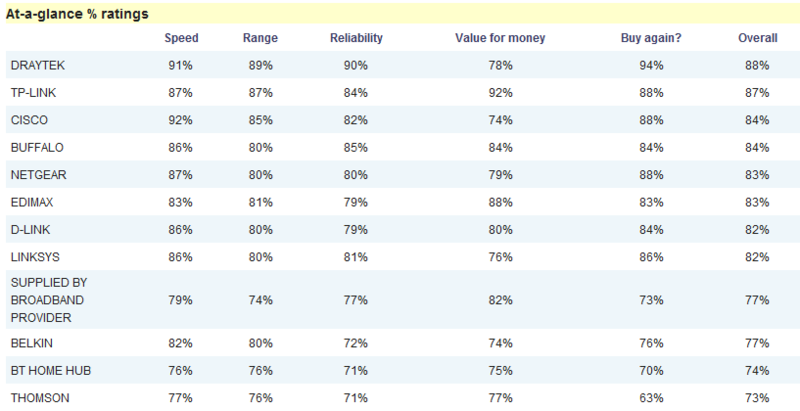 Value for Money is the one area in which DrayTek is found wanting, with a below average score. If it’s a bargain you’re looking for, the Highly Commended TP-Link leads the field with a score of 91.5% satisfaction when it comes to Value for Money. Our survey also confirms what our reviewers have long suspected: routers supplied by ISPs are distinctly below par, with below average scores for speed, range and reliability. BT’s Home Hub also suffered in our survey, with the worst speed score of any router manufacturer. The ratings above are based on PC Pro’s Excellence Awards survey, which took place between May and August 2011. More than 10,00 readers filled out this year’s survey. We ask our readers to rate each product on a number of different factors, such as performance, reliability and value for money. We convert those answers to numeric values: ten for very satisfied, eight for satisfied, five for neither satisfied or dissatisfied, two for dissatisfied and no points at all for very dissatisfied customers. By dividing the cumulative score by the number of votes we obtain a percentage score for each of the voting categories, and an overall percentage score. 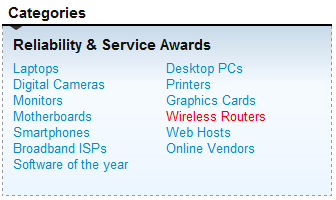 Only companies that register a statistically significant number of votes are included in the awards tables.